CHERAW, S.C. — Camp Exploration, a summer day camp for rising seventh, eighth and ninth graders, will be held on the Cheraw campus of Northeastern Technical College this summer beginning July 12 through July 17. The theme of the camp is “Amazing Automation” and the program will guide campers through a diverse schedule of workshops, interactive learning activities, career exploration, leadership activities and a field trip to learn about advanced manufacturing, engineering, science and technology. Workshops will be led by college faculty while students are chaperoned by qualified middle school and high school faculty and student teaching assistants. 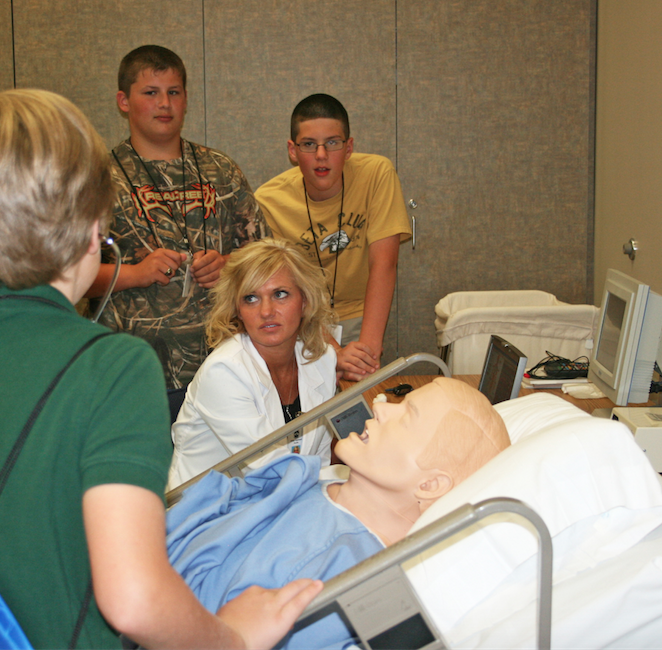 NETC Nursing instructor Holly Copeland shows Camp Exploration campers how robotics are used to train nursing students. The camp will be from 8:30 a.m. – 2:30 p.m., Monday through Thursday, and Friday 8:30 a.m. – 12:30 p.m., July 13 through July 17. There will be an orientation session on Sunday, July 12 from 4-6 p.m., for all campers and their families. At least one parent or guardian is required to attend the orientation session with a participating camper. A Soft Skills for Success panel and other activities will be part of the Sunday session. Camp Exploration has 25 openings for students. Participants must apply by June 30, 2015. The cost of the camp is $50. Limited scholarships are available and must be requested at the time of application. For more information about the program and/or the application process, call Northeastern Technical College at 843-921-6920. Camp Exploration is offered in partnership between Northeastern Technical College and the Pee Dee Regional Education Center. The goal of the program is to inspire, support and prepare students for success in the workplace while helping to improve the quality of life for all South Carolinians.